About 1.4 million Canadians reported that they had been a passenger in a vehicle driven by someone who had consumed cannabis in the previous two hours. In addition, according to combined data for the first and second quarters, one in seven cannabis users with a driver's licence reported that they got behind the wheel at least once within two hours of using the drug in the past three months. To monitor cannabis consumption before and after the legislative change, Statistics Canada is conducting the National Cannabis Survey (NCS) every three months (quarterly) throughout 2018. This release provides the newest information about how cannabis use in Canada is changing, and includes information about its use as it relates to driving. New NCS data for the second quarter, collected from mid-May to mid-June, includes data for the provinces, as well as the territorial capitals. Safety concerns remain about whether legalization for adults will lead to an increase not only in the use of cannabis, but also in cannabis-impaired driving. Statistics Canada traditionally monitors cannabis-impaired driving by tracking incidents of drug-impaired driving reported to police. These data indicate that drug-impaired driving incidents more than doubled from 2009 to 2017. Some of the rise, however, may reflect improvements in detection and more complete police reporting, rather than an increase in the frequency of such incidents. Not all drug-impaired driving is detected by police, and the NCS included questions about driving after cannabis use to provide a fuller statistical picture of this phenomenon. According to the most recent data collected over the first half of 2018 (first and second quarter surveys combined), 14% of cannabis users with a valid driver's licence reported driving within two hours of using cannabis. Males were nearly two times more likely than females to report this behaviour. The proportion of people who reported driving within two hours varied little across the country. British Columbia was the exception, with 8% of drivers reporting this behaviour—a share considerably lower than the national average. Driving within two hours of using cannabis was also more than four times as common among drivers who reported daily or almost daily cannabis use (27%) than it was among less frequent users (6%). Being a passenger in a vehicle with a driver who has been using cannabis within two hours can be dangerous. According to second quarter data, 5% (1.4 million) of Canadians aged 15 years or older in the provinces and territorial capitals were passengers in vehicles operated by drivers who had consumed cannabis within the previous two hours. While the likelihood of reporting this activity did not differ by gender, it did by age. Youth and young adults aged 15 to 24 reported being passengers in vehicles driven by potentially impaired drivers more than twice as frequently as people aged 25 or older. In the second quarter of 2018, 12% of Whitehorse residents and 10% of Iqaluit residents reported being a passenger in a vehicle operated by a driver who had consumed cannabis, figures that are above estimates for the rest of Canada (other provinces and territorial capitals combined). At 3%, Saskatchewan residents reported lower-than-average occurrences. Among current cannabis users, 25% reported getting into a vehicle with a driver who had consumed, compared with 2% of non-cannabis users. Risk-taking behaviours are often related. Additional analysis shows that two-thirds of people who had driven a vehicle within two hours of using cannabis also reported being passengers in vehicles operated by other drivers who had consumed within two hours. The second quarter NCS showed that about 4.6 million people nationally, or close to 16% of Canadians aged 15 years or older, reported using cannabis in the prior three-month period. That was a similar proportion to what was reported in the first quarter. According to second quarter 2018 survey data, 21% of Nova Scotians and 18% of Ontarians reported using cannabis in the previous three months, above the estimates for the rest of Canada (other provinces and territorial capitals combined). Use in the previous three months was also higher than the national averages in each of the territorial capitals: Whitehorse (23%), Yellowknife (27%) and Iqaluit (33%). Meanwhile, use in the previous three months was lower than the national average in Quebec (11%) and Saskatchewan (10%). At 19%, the rate of cannabis use among males in the second quarter remained higher than that of females (12%). Cannabis use tends to decrease with age and the survey indicates that use among 15- to 24-year-olds (33%) was nearly two-and-a-half times the rate for those aged 25 or older (13%). With use being more common among the young and given that different regions of the country vary in their concentrations of youth, it is likely that at least some of the geographic variation in cannabis use prevalence is due to demographics, that is, the age profile of a region. This is particularly true of the territorial capitals where the populations tend to be considerably younger than in the rest of the country. While second-quarter reported usage was unchanged at the national level, a closer look by region suggests a few changes may be occurring. For example, the percentages that reported using cannabis appeared to rise between quarters in Ontario, and to fall in Saskatchewan. Monitoring of these numbers is ongoing so that a clearer understanding of cannabis usage trends can be determined. Canadians who reported using cannabis in the past three months were asked about the types of products used in this period, as well as the quantity of each. As in the first quarter, data from the second quarter show that dried flower/leaf was the most popular (86%), followed by edibles (32%). Other popular products, each used by one-fifth of cannabis consumers, included hashish and kief (20%), liquid concentrates (20%) and vape pens (cannabis oil cartridges) (19%). 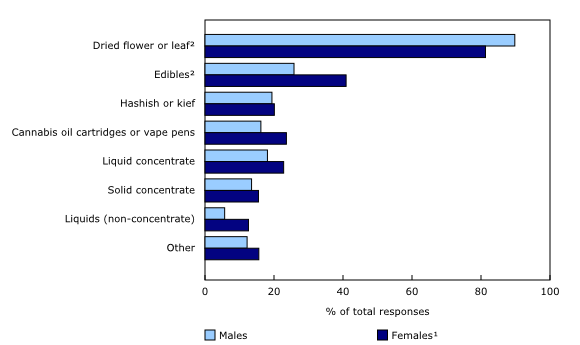 Analysis by gender shows that higher percentages of males reported using dried flower/leaf than did females, while the opposite was true for edibles. For example, the use of dried flower/leaf was reported by 90% of males and 81% of females, while 26% of males reported using edibles compared with 41% of females. Use of other products did not differ by gender. In the second quarter, one-third of cannabis users reported spending nothing on the cannabis consumed, while another 25% spent up to $100, 21% spent up to $250, and the remaining 21% spent more than $250. This was nearly unchanged from the spending reported in the first quarter. As expected, reported frequency of cannabis use was associated with amount spent. In other words, higher spending was concentrated among more frequent users, and little or no spending among infrequent users. For example, among cannabis users who said they only tried or used cannabis once or twice over the period, more than 60% indicated that they had spent nothing. 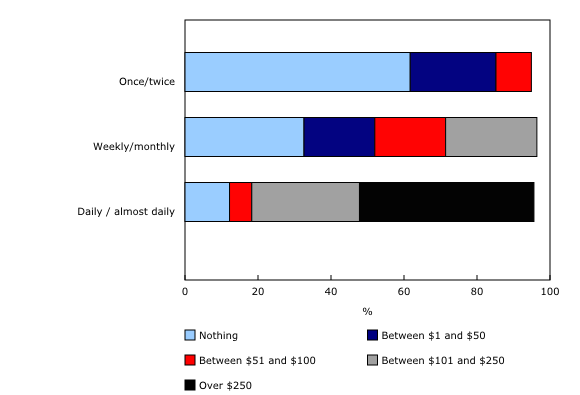 In contrast, nearly half of daily or almost daily users reported spending in excess of $250, and another 30% reported spending between $100 and $250. Canadians were asked if they thought they would change their behaviour once the non-medical use of cannabis is legalized for adults. Overall, more than 8 out of 10 (82%) said they would be unlikely to try cannabis or to increase their consumption with legalization, relatively unchanged from the first quarter result (79%). However, intention to use cannabis in the future and once legal largely depended on whether the person reported current use. Among current users, 28% indicated that they would be likely to increase their use, more than four times the percentage (6%) of those not currently using. Statistics Canada collaborated with partners within Health Canada, Public Safety Canada and the Public Health Agency of Canada to develop this new survey, entitled the National Cannabis Survey (NCS). This survey falls under the new 'Rapid Stats' program being offered by Special Surveys Division, Statistics Canada, to rapidly respond to pressing data needs. The main objective of the NCS was to focus on the level of cannabis use in the past three months, and the likelihood that respondents may change their cannabis-related behaviours during the period immediately preceding and following legalization on October 17, 2018 of non-medical cannabis by adults. The second quarter data were collected in the 10 provinces and the territorial capitals (Whitehorse, Yellowknife or Iqaluit) in May and June 2018. The first quarter data were collected in February and March 2018 (provinces only). The second quarter survey response rate was 51.3% and yielded a sample of 7,285; the corresponding figures for the first quarter were 51.2% (response rate) and 5,817 (sample). The percentage of cannabis users using each product type, e.g. dried flower or leaf, was calculated based on having provided either a valid quantity or indicated a unit of measure associated with a product, e.g. grams or 1/4 ounce. Preliminary analysis of second quarter results were estimated with and without data from the territorial capitals. Because the results did not change appreciably with the territories, all second quarter results presented include the territorial data. The information is self-reported and has not been validated. Social desirability and fear of punishment, both of which are potential sources of bias, may be especially relevant to this analysis. Changes over time in respondents' willingness to admit drug use may be influencing the statistics but remains difficult to measure. Please consult the Statistics Canada Cannabis Hub. The infographic "National Cannabis Survey, 2nd quarter 2018," which is part of Statistics Canada — Infographics (Catalogue number11-627-M), is now available.